Fethiye has some of the most luxurious and affordable properties for sale in Turkey. Whether you are looking for a sea-front villa, an apartment close to a popular holiday resort, or a large villa with natural surroundings, Fethiye can cater to your taste and style. Our select and handpicked portfolio include bargain villas in Ovacik, investment apartments in Calis, luxury villas in Gocek, lifestyle properties in Fethiye Town, and wonderful villas in Uzumlu with brilliant views of nature. Error: please check form data again and resubmit. 3-bed duplex apartment for sale in Gocek with beautiful nature views. In a complex close to the centre with a large pool. Fethiye investment property. A 2 bedroom modern apartment for sale in Hisaronu with a central location, nature views and a large shared pool for an ideal investment in Fethiye. Luxury marina property in Fethiye for sale - A luxury sea front penthouse in Karagozler with panoramic sea and marina views. Prestigious investment. Peacefully located Ovacik villa for sale with private pool and gardens. An ideal investment choice within easy walking distance to lively Hisaronu. A spacious 6 bedrooms family villa for sale in Uzumlu, Fethiye. Offering stunning nature views and a large private pool at an affordable price. Villa for sale in Ovacik, next to a beautiful pine forest and close to Hisaronu. Ideally located for an investment choice with good rental potential. An excellent low-budget one bedroom investment apartment for sale near the beach in Calis, Fethiye. In a popular complex with a great rental history. Fethiye apartment for sale close to the resort centre and the beach in Calis. An ideal buy-to-let investment property with excellent rental potential. Three-bed duplex Fethiye apartment for sale a short distance from the beach in Calis. In a complex with a pool, an ideal buy-to-let investment. Modern Fethiye property for sale, located close to the beach in Calis. An ideal holiday home or investment in Turkey with good rental potential. An opulent 5 bedroom property for sale in Ovacik, Fethiye. Enjoying spectacular views of the sea and Oludeniz for the ideal investment in Turkey. Finding a trustable property consultant is nearly as important as finding the right property in Fethiye. With over ten years experience in the region and a laid back consultative approach, we aim to listen to your requirements, working with you for a positive outcome. Our handpicked Fethiye portfolio is only the start of the journey. Off-plan project of luxury 4-bed villas in Ovacik for sale with mountain views. Walking distance to amenities & easy beach access. Fethiye investment. Sea view apartment for sale in Fethiye Town. Located on a hillside surrounded by nature with private parking & easy beach access. Fethiye investment. A modern apartment for sale in Calis. Walking distance to the beach and amenities, easy access to Fethiye Town and mountain view. Fethiye investment. 4-Bed luxury villa in Ovacik for sale with mountain views, ample amenities in a short walk and oodles of privacy. Ideal Fethiye investment property. Modern apartments for sale in Fethiye Town with sea and nature views. Close to the town centre in Tasyaka with ample amenities. Fethiye investment. A 2-bed ground floor apartments in Fethiye Town for sale. A newly built modern home in Tasyaka with nature views for an ideal investment in Fethiye. A 2 bedroom sea view apartment for sale in Fethiye town. A newly renovated property on a hillside complex with a pool. Ideal Fethiye investment. Modern 2-bed apartment for sale in Fethiye Town. Located in the desirable area of Tasyaka with ample amenities & easy beach access. Fethiye investment. Luxury 4 bedroom villas for sale in Ovacik with nature views, private gardens, walk-in swimming pools and ample privacy. Ideal Fethiye investment. Luxury 4-bed villas for sale in Ovacik with sea views. Easy access to amenities and the beach with large private swimming pools. Fethiye investment. A 2 bedroom ground floor apartment for sale in Fethiye Town. Located close to the university and amenities in Tasyaka. Fethiye investment property. Detached 2-bed villa for sale in Ovacik with mountain views. In a popular complex with a large shared pool. Ideal and affordable Fethiye investment. Ovacik land for sale a short walk to all amenities & Hisaronu with a stunning mountain backdrop. 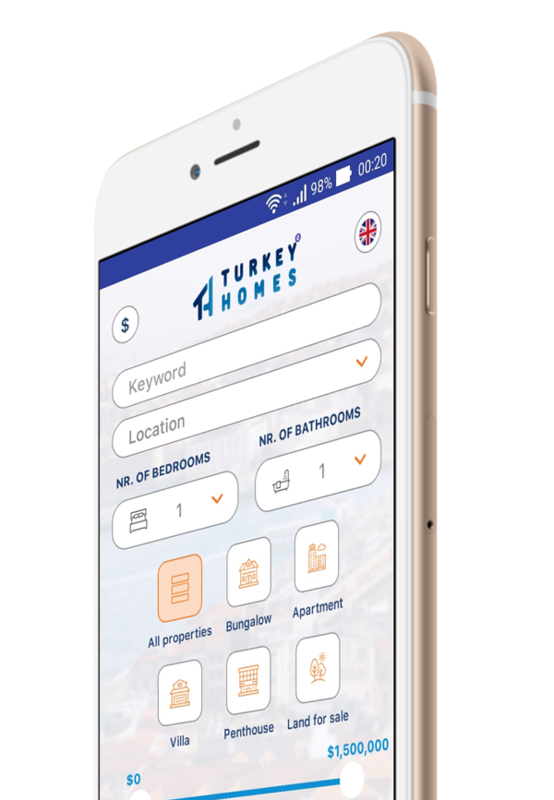 Build your dream home with Turkey Homes assistance. A 4-bed traditional semi-detached villa for sale in Calis. Close to local amenities, lots of outdoor living space and walking distance to the beach.